The bright summer sun means it'll soon be time for summer BBQ's, parties, and 4th of July celebrations. If you're getting ready to host a party this summer, you're going to love this awesome collection of 25 4th of July Crafts. From simple votives to fun banners, these 4th of July crafts are great for getting your home ready for summer celebrating. 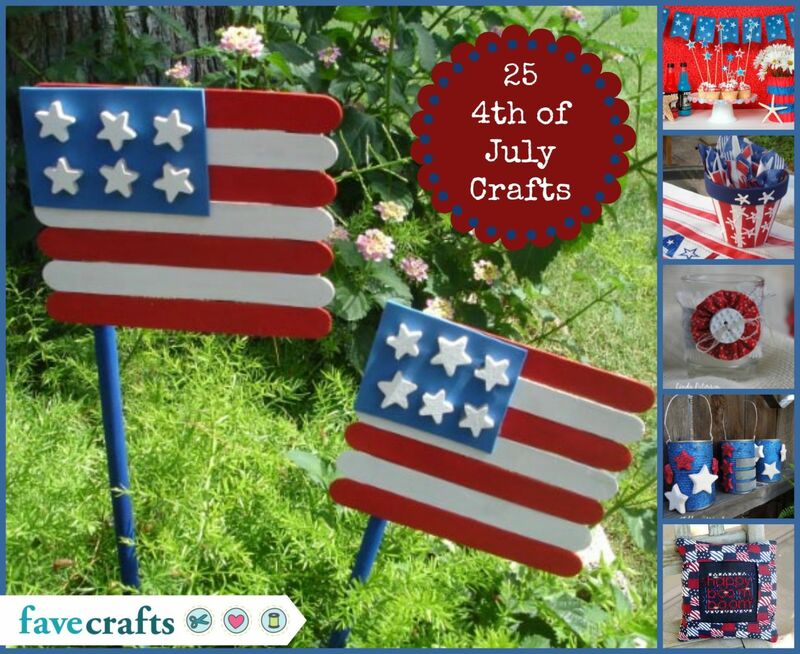 Great for using both indoors and out, these decorations are sure to add a fun flair to your patriotic celebrations. Kick things off with this adorable 4th of July Party Decor. With lots of projects all in one, this is a one-stop project for the busy crafter! These Crafty Wooden Stick Flags are also great for lining your driveway or marking a parade route. Kids will love helping you craft these American flags, and this makes a fun activity for kids to do at a summer BBQ or family reunion. So whether you're hosting a 4th of July celebration or you're just looking for some patriotic crafts to add some American-themed decor to your home, these 25 4th of July crafts are sure to please all you patriotic DIY hostesses! The great thing about these 4th of July crafts is that they can be used both indoors and out, so liven up your living room, add a festive look to your front yard, or get your outdoor BBQ ready to go with our easy and fun 4th of July party decoration ideas! 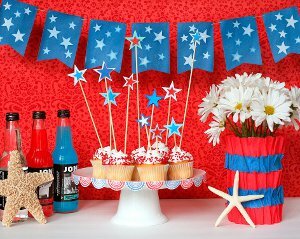 4th of July Party Decor: Are you planning a little 4th of July get together with friends and family? Check out this 4th of July Party Decor collection, complete with cute utensils, favors, and decorations. This easy party theme would also be great for a Memorial Day picnic or any time you're feeling especially patriotic. 4th of July Votive: Add some light to your outdoor celebration with these cute and fun votives. Embellished with ribbons and buttons, these 4th of July decorations can also be used for Valentine's Day, weddings, and so much more! These can also act as a cute tableweight to hold down the tablecloth when you're eating outside. 4th of July Utensil Holder: All your guests will love this cute utensil holder. Made with colorful patriotic ribbons, this 4th of July craft is classically American. Use it to hold utensils, flowers, or even chocolate covered pretzel rods! Americana Mason Jar: Add some vintage charm to your 4th of July decorations with this Americana Mason Jar. Great for storing silverware, flowers, or just sitting as is, 4th of July crafts like this are great for adding a nice touch to your patriotic celebration. This is an easy project that you can do in a weekend and you're sure to love the results! 4th of July Luminaries: Before you host a backyard barbeque, make a few Repurposed Patriotic Luminaries out of empty tin cans. This is sure to become one of your favorite 4th of July crafts. Decorations can be expensive but this one is perfect for frugal crafters. Gingham Salt and Pepper Shakers: Create cute salt and pepper shakers to match your 4th of July decorations with these Gingham Salt and Pepper Shaker covers. This is a quick and easy project to make and a fun way to bring everything on the table together. 4th of July Parade Chairs: These July 4th chair covers are the perfect way to make your 4th of July celebration festive. Add this easy, no-sew project to your list of 4th of July crafts to make this year, and watch the fireworks in style. Country Picnic Utensil Holders: Give your 4th of July decor a little rustic feel with these cute Country Picnic Utensil Holders. Using old soup cans, these containers are a breeze to make and can be whipped up and ready to go about an hour before you need them! Rustic 4th of July Centerpiece: This 4th of July Centerpiece just screams patriotic pride! Great for the table or just to have on display somewhere in your home, this 4th of July craft is easy to make and fun to show off. Outdoor Party Lanterns: Are you looking for some clever outdoor July 4th decorations? Try these Outdoor Party Lanterns! 4th of July crafts like this can be used to add a fun and magical feel to your patriotic celebration. 4th of July Placemat: This adorable patriotic table decor is great for a 4th of July celebration! Made to resemble an old pair of jeans, this cute table placemat makes entertaining fun and easy. If you're feeling especially creative, you can embellish each placemat with your guests' names for a fun party favor they can take home later! American Stars Garland: Great for both indoors and out, this American Stars Garland is a fun and festive way to show your patriotic pride. 4th of July crafts like this are great for the kids, too...so get the whole family together and create this fun and easy banner. Firecracker Holders: Use these cute firecracker holders to store your sparklers and fireworks. This is a great project for both kids and adults alike, and it's as versitle as it is easy to make. Pleated America Banner: With stars and stripes running throughout the banner, this cute bunted project is a fun and creative way to decorate your home for the 4th of July. Best of all, Fourth of July decorating ideas like this are great for both indoors and out! 4th of July Centerpiece: This cute centerpiece is sure to spark up some conversation at your 4th of July BBQ! Made with patriotic ribbons and family photos, 4th of July crafts like this are great for reminding us to celebrate all the important things. Happy Boom Boom Pillow: Add some patriotic flair to your indoor or outdoor decor with this cute 4th of July project. You could also bring this festive pillow with you to go see the fireworks so you can watch the show in comfort and style! 4th of July Silverware Container: This simple 4th of July craft makes hosting easy as apple pie! Simply decorate a terra cotta pot with red, white, and blue and fill it with plastic silverware. 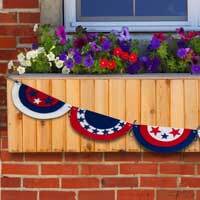 This Fourth of July decor can then be used as a cute planter when your celebration is over. Independence Day Centerpiece: Create the ultimate Americana decor with this Independence Day Centerpiece. Patriotic decorations like this can even be on display year round to show off your American pride all the time! Patriotic Star: This cute star is great for hanging on your wall or front door. Welcome guests to your home for a 4th of July celebration with this cute country patriotic project! 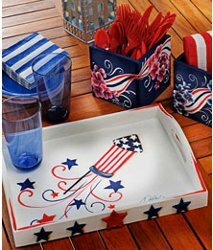 One Stroke 4th of July Platter: These cute drink platter is great for serving your guests at your 4th of July celebration. Created using the one stroke painting technique, this 4th of July craft is great for crafters of all skill levels. Allium Centerpiece: Get in the American spirit with patriotic centerpiece ideas like this Allium Fireworks Display. Made with dried flowers and spray paint, this beautiful and easy 4th of July craft is perfect for decorating your home. Firecracker Centerpieces: These firecrackers are great 4th of July crafts for adults and kids to do together. When gathered all together in an arrangement, these patriotic decorations look great on a table or mantle. 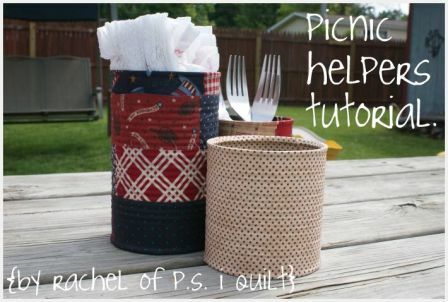 4th of July Picnic Crate: Store silverware and napkins in this cute Picnic Crate. Fourth of July decor like this is great to use year after year, and it makes hosting a celebration easy and affordable. The best thing about 4th of July crafts like this is that they're quick and easy to make, so you can have fun patriotic crafts in no time! 4th of July Party Signs: Use these patriotic chalkboard labels to identify the different dishes at a Fourth of July spread. These lovely mini-chalkboards are easy to paint and can be used again and again. You can also use them as place cards at a sitdown meal on the Fourth of July. Crafty Wooden Stick Flags: Looking for some Fourth of July crafts for kids? These Crafty Wooden Stick Flags are perfect! Line your walkway with these cute July 4th decorations or turn them into cute buttons and embellishments that are great for showing off at the local parade. I really appreciate you putting the little thumbnails of all the projects at the top of the page. It makes it so much easier to find something I would like to do without having to click through a ton of links. Thanks!